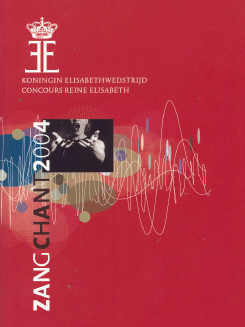 The Concours Reine Elisabeth is a famously great music competition, held annually in a four year cycle for composers, pianists, violinists and singers; this year was the turn of singers again, next in 2005 will be violinists. Having reviewed CDs of earlier Brussels competitions, we decided to attend this year, CDs sometimes giving an unreliable and selective impression of a live singing event. Clearly a prime event in the Brussels cultural calendar, the later sessions of this prestigious competition, the huge hall of the Palais des Beaux Arts was completely sold out every night for the Finals, attended by Queen Fabiola. There is a substantial educational input for musicians at earlier stages of their development, and for those who reach the finals there are sessions with the conductors and coach pianists, and lastly with the orchestras. Members of the jury give public Master Classes. The sheer scale of the enterprise must be uncommon, certainly so in Europe, with the finals spread over four days in which twelve laureates are judged by a jury of twelve. The young singers are judged by a huge panel of notabilities from the worlds of opera and song, and there is comprehensive coverage on TV and by streaming on the internet, culminating with a media razzmatazz. The finals sessions take the form of evening concerts, each evening with two fine orchestras sharing the task of accompanying the contenders, UK's Academy of Ancient Music for baroque repertoire, and the Monnaie Symphony Orchestra of Brussels Opera in full force for music after 1750. The standard on the first evening was no more than moderate, with several singers under-powered, their voices sounding unready for large symphony halls and opera houses. The rest of the twelve finalists had the first of their two scheduled appearances next evening after which, on my reckoning, nearly half of them could have safely been eliminated, raising a serious question whether the Concours this year could support twelve finalists? Are there any other competitions in which jury members have to keep in mind performances spread over four days of 'finals'? Several competitors did themselves less than justice by presenting unsuitable programmes. The biggest hit with the audience at the first competition concert was one of the two home players who survived the earlier stages. Belgian baritone Lionel Lhote negotiated the fast patter of Rossini's barber stylishly, but ruined Berlioz's spectral rose by his uncontrolled wobble, and he hammed up Verdi's Rodrigo inexcusably; he made no better impression in Handel, with poor English, sounding as if he had a plum in his mouth, his vibrato contrasting with the steadiness of David Blackadder's heroic obligato baroque trumpet. Lhote was popular with the audience; he has stage personality and boundless confidence but needs urgent therapy for his faulty vocal technique. Romanian soprano Teodora Gheorghiu presented Bach and Handel with a pure light soprano voice and winning, involving manner; I noted that I would enjoy hearing her again in concert; likewise the charming light soprano of Quebecoise Helene Guilmette , who was secure in two Handel excerpts as Cleopatra cheerful and despondent, but was offering nothing in her native language. The Moldavian mezzo Diana Axentii made a good start in Bach by upstaging the violin introduction of Pauline Nobes, and her authority as Handel's Sesto lifted the AAM to make L'angue offesto memorable. As Dido her English - 'remumber me' - was sadly wanting; a short spell at the Guildhall School in London could sort that out quickly, and several others had problems singing in English. Outstanding in the first session with the opera orchestra was the Estonian soprano Aile Asszonyi , who seized and held attention, and impressed by switching from Fiordiligi to Mimi via Stravinsky's Anne with sure sense of style. She also included a less satisfactory little nod to Russia in an orchestration (unknown to me) of one of Mussorgsky's Nursery Songs , not succeeding there in colouring her voice to suggest a little boy. The temperature was raised dramatically at the end of the second evening by two real opera stars in the making, both of whom rode with ease the large symphony orchestra in full throttle. Mary Elizabeth Williams of Philadelphia has a flourishing career in USA and France; she delighted with her rich and wide ranging soprano/mezzo voice, encompassing the contrasting idioms and moods of Duparc, Verdi, Massenet, Mahler & Puccini to acclamation. Vladimir Baykov is an established bass soloist in Moscow and Helsinki; the stage was filled with extra musicians for his daring choice of the extended last scene of Die Walkure, Wotan's Farewell and Magic Fire Music , followed by Gounod's Mephisto and Glinka's Blizok uzh tchas , a comic aria from Ruslan and Ludmilla to clinch his claim to supremacy. Casting directors should be beating a path to Baykov's door for Boris and Wotan - world class basses are in short supply! At this stage I formed a proposition that no singer's rating was likely to be improved by the baroque offering, and this was duly vindicated. The first half of the third evening was a dreadfully dull hour and a quarter, with a procession of Bach, Handel and Purcell da capo arias which, to our critical ears, failed to enhance the standing of those who had sung with the opera orchestra two nights before, and slightly reduced Assonyi's. Only very few of the competitors previously eliminated had ventured a little further afield, offering Pergolesi, Vivaldi and Monteverdi - no one tackled the French baroque repertoire. Compulsory Handel (why have him singled out?) found some unfamiliar with this repertoire, their eyes glued to the page of their scores, and several were taxed by having to sing in English. Some suffered by having their singing upstaged by the the AAM and its soloists; there was little evidence of efforts to match the orchestra's period playing style. Paul Goodwin and his band took most of the honours in the baroque first halves of the evenings; Mozart, which they programme regularly, might better have been entrusted to the AAM for a better balance of interest? But there were great surprises to come after the interval. Teodora Georghiu showed herself a complete coloratura star as Bellini's sleepwalker and in an absolutely delicious account of Zerbinetta's fearsome scena; her performances with the two orchestras were so uniformly excellent as to bring her into strong contention for one of the major prizes. The other surprise was the Belgian bass Shadi Torbey , who had made a muted start two days before, telling of Handel's people who walked in darkness in fallible English, and seemed unable to sustain concentration, despite having a mellifluous bass/baritone vocal quality. But he ignited his second appearance in the Finals with wise and clever choices, despatched with magisterial command and easy, secure delivery. Mozart's Per questa bella mano was a greatly welcomed rarity, its success shared with the Munt/Monnaie orchestra's unnamed principal double bass. And to confirm Torbey's powerful contention for a supreme accolade he brought variety and depth, with seeming ease of vocal production, to the conflicting emotions of Assur's great scene in Semiramide which, with Marc Soustrot's exciting accompaniment, reminded us how undeserved has been the eclipse of Rossini's serious operas. There were no significant surprises in the last evening's singing to make us amend our provisional opinions; it was a long and lack-lustre evening of miscellaneous arias before the 'proclamation' of the results, that ceremony not completed until 1.15 a.m. Surprise was reserved for the awards themselves which brought mixed responses from the audience, as is so common with music competitions. Two of the singers we had placed in contention for that Queen Fabiola Prize were relegated to the unnumbered second six of the twelve laureates. One of them, the last to receive her bouquet, did so accompanied by vociferous cheering and sustained slow handclapping from an audience demonstrating its collective displeasure with the jury's verdicts. The winner of the First Prize, Iwona Sobotka, has not been mentioned in this independent account of the proceedings! We will follow her career with interest. Two of the six main prize winners were amongst those whom we had thought ought not to have qualified as finalists and laureates. Readers should make allowances that our responses have been based only on the finals, and that the audience was without the benefit of words and scores provided to the jury; not even any introductions to the less familiar items. Nor were we privy to the marking system and criteria addressed, whether earlier rounds were included in the jury's considerations, and whether there was discussion as well as numerical marking; perhaps, if there had been, the deliberations might have gone on all night! It would be fascinating also to know the thoughts of the conductors who had rehearsed with the competitors before their public appearances! The full results can be seen on the QEC website. Controversial results are not necessarily bad results - it all helps to focus attention and to avoid a slide into predictability and boredom! The esteemed QE Competition is of great value to individual musicians, contributing to furthering their careers at a crucial stage. It also helps to oil the nowadays creaking wheels of the classical music business at large, and it contributes to confirming Brussels as a lively age-old and continuing European cultural centre, with its exceptional museums of art ancient and modern for visitors to enjoy before the evening concerts.